Our treats have a rich taste; however, the "richness" does not come from butter, sugar and eggs. In the Carrot Cake, for example, it comes from the fresh carrots, crushed pineapple, organic raisins and walnuts combined with the organic whole grain oat flour and organic agave syrup for a dense, moist cake. The frosting is a very smooth, "creamy" texture that is made of organic silken tofu (no one will know!) and sweetened with either organic agave or organic birch sweetener. This cake is very satisfying, both nutritionally and deliciously. 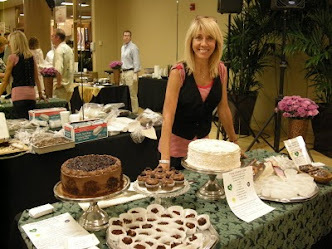 Gluten-Free Cakes Are made with organic brown rice flour. Any of our cakes can be made gluten-free, including Triple Coconut, Carrot, Chocolate Raspberry, Chocolate Brownie, Chocolate Cherry, German Chocolate, Fresh Banana Chocolate Chip, Fresh Lemon Raspberry, Toasted Almond Torte, Apple Spice. Diabetic-Friendly Cakes are sweetened with an organic birch sweetener from Finland (Xylitol - not related to sorbitol, manitol or maltitol). All flavors of cakes can be made, although some like Carrot Cake, would still have the raisins and pineapple adding to the "sugars" in the nutritional profile; hence, Chocolate Brownie or Triple Coconut would be a better choice. Xylitol is derived from birch bark, and is 100% pure birch sugar. No birch trees are ever cut down for the extraction of the Xylis (the chemical name for the sweetener in the birch bark). It has half the calories of sugar. It is the only natural sweetener that does not promote tooth decay and gum disease which is why it is used in premium toothpaste and mouthwashes. In spite of the fact that it is a pure carbohydrate, it is metabolized very slowly. This helps prevent sugar "highs" and "lows" experienced by people who have diabetes, hypoglycemia, chronic fatigue syndrome, candida or any condition caused by sugar imbalance.